Even low dilutions of Manuka honey can curb the activity and growth of bacterial biofilms - the thin but resilient layer of microbes that build up on, and stick to, any surface including plastic, according to new research from the University of Southampton. The findings, published online in the Journal of Clinical Pathology, raise the prospect of the honey’s potential use in patients fitted with medical devices, such as urinary catheters, which carry a high infection risk. Around 100 million urinary catheters, used to drain the bladder of urine, are sold worldwide every year. Up to one in four hospital inpatients may have to use a catheter. However, long-term use is associated with frequent complications, such as inflammation and infection. The use of honey as a health remedy dates back centuries, and among other things, recent research suggests that it may have antibacterial and anti-inflammatory properties. Manuka honey is a monofloral honey produced in Australia and New Zealand from the nectar of the manuka tree. 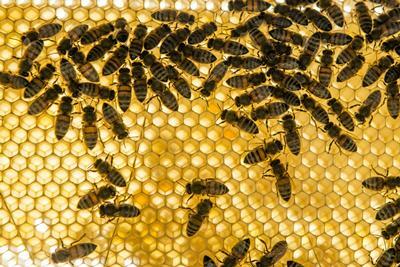 To find out if Manuka honey has a role in stopping the establishment and development of biofilms, the researchers cultured strains of Escherichia coli and Proteus mirabilis bacteria on plastic plates in the laboratory. These two bacteria account for most of the urinary tract infections associated with long-term catheter use. The honey was diluted with distilled water and added to medium to give different ‘strengths’: 3.3 per cent, 6.6 per cent, 10 per cent, 13.3 per cent, and 16.7 per cent. In the first part of the experiment, the various dilutions were added at the same time as the bacteria in two of the wells of each of the 96 plates, and just plain medium or artificial half strength honey to the other two wells.These were then sealed and incubated for 24, 48, and 72 hours to see whether the honey had any effect on the formation of a biofilm. In the second part of the experiment, honey was added after 24 hours and incubated for either a further 4 or 24 hours to see if honey restricted growth of the biofilm. The results showed that Manuka honey strongly inhibited the ‘stickiness’ of the bacteria, and therefore the development of a biofilm. Even at the lowest dilution of 3.3 per cent, it curbed stickiness by 35 per cent after 48 hours compared with the plain medium and artificial honey. But the greatest effect was seen after three days and at a dilution of 16.7 per cent, when stickiness had been reduced by 77 per cent. All the dilutions suppressed this by around 70 per cent after three days. As to the impact of Manuka honey on further growth, the 16.7 per cent dilution restricted growth by 38 per cent after 4 hours and by 46 per cent after 24 hours. The impact was even stronger after 48 hours, but not for the weaker dilutions of 3.3 per cent and 6.6 per cent. The researchers point out that their study only related to the stickiness of bacteria and early biofilm development under laboratory conditions and further studies in which clinical conditions more closely resembling the flow of liquid in the bladder would be needed before any firm conclusions could be drawn.